Interested in a summer internship working on breeding and development of new nursery and bioenergy crops? This position involves assisting graduate students and staff with a broad range of research projects including plant breeding and improvement, propagation, production, tissue culture, and cytogenetics. Specific duties include transplanting, pollinations, seed and cutting propagation, tissue culture, cytology, plot maintenance, data collection, etc. Interns can also participate in independent research projects, field trips, and journal article reviews. Position is located at Mountain Horticultural Crops Research and Extension Center in Mills River, NC. $10-14.00/hr depending on experience. We are looking for motivated individuals who have passion and enthusiasm for plants, horticulture, and scientific research. Applicant must be enrolled in a 4-year, undergraduate plant science program or be a recent graduate. If you would like to apply, please submit a resume, list of courses and grades, list of references, and a short letter stating your background, interests, and career goals online. Position #:11ASO1235. Application deadline: February 17, 2019. • N.C. 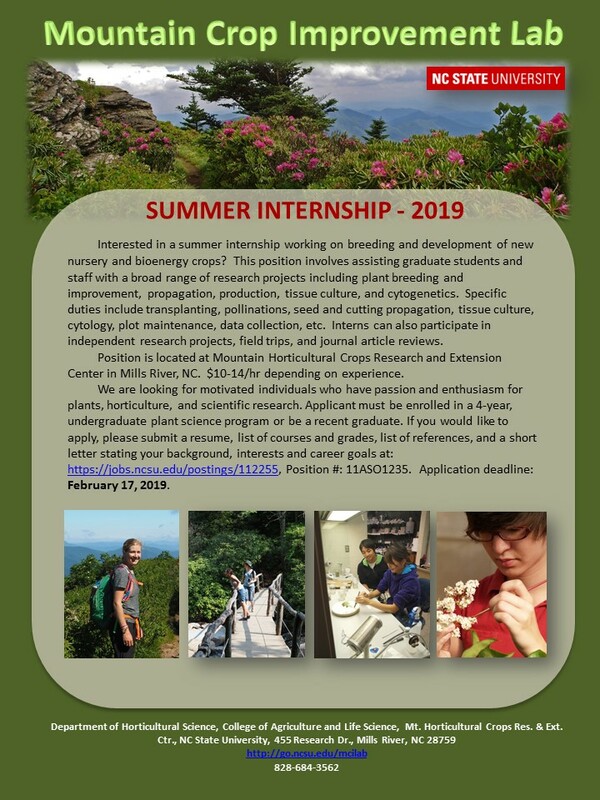 Cooperative Extension in Rowan County Is Seeking Summer Intern!